My Animistic Architecture post showed you the venue for the conference I recently attended, the Society for the Anthropology of Consciousness, aka SAC. This is a group I’ve been part of for the last 15 years or so (omg!) This one will give you a taste of what it’s like to be there. SAC conferences are much more fun than ordinary academic conferences. It’s an interdisciplinary group interested in exploring issues of consciousness – in other words, a collection of really interesting people looking at weird topics in a rigorous way, a task requiring both imagination and bravery. There is also often a lot of laughter. Besides papers, SAC always includes hands-on experientials so we can play with each other’s ideas. Among those I attended was biophysicist Beverly Rubik’s session on changing the molecular structure of water with our intentions and emotions. It was fascinating. Rubik began by putting an eyedropper full of tap water into her GDV (Gas Discharge Visualization) machine that can digitally illustrate water molecules. (We all wanted one afterwards, of course. You too? Start saving: they cost $10,500.) She then digitized the image and projected it on a screen, showing us the various aspects you can examine. These include shape, area or size, brightness, density, uniformity, and dimension. 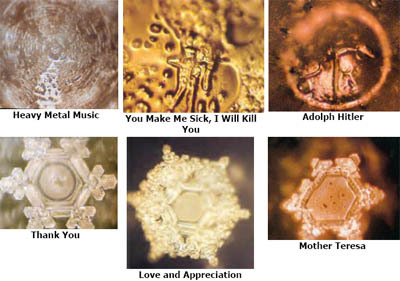 The images were simpler than Masaru Emoto’s, being more of a computer model or kirlian photography than a snowflake-like photo, but striking nevertheless. (I wish I had a picture to show you, but I don’t.) “Water carries information via its microstructure,” Beverly informed us. “Tears of joy are different from tears of grief. Beverly also showed us images of other types of fluids, including blood. This was an eye-opener. Since our bodies are mostly water, and the blood most of all, it can also be looked at in this way – as another form of water. 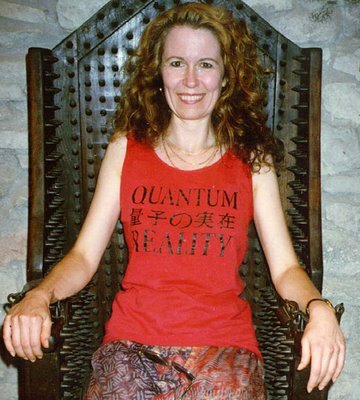 She said we are much better off drinking fresh water and eating living foods, no surprise here – but one reason is that water tends to cluster together, and therefore it gets big when stagnant (like when it’s been bottled); so big at times that it can’t enter our cells. And if we’re dehydrated, we’re compromised in many ways, including loss of the ability to regulate subtle energy. It turns out that old Weston A. Price was totally right with his take on how a non-indigenous diet alters the physical structure of our bodies. The molecular structure of the blood of a person who ate according to those standards was beautiful and clean and strong, even though he was in his 80s. The blood of a much younger woman who drank Coke at every meal for the past 30 years (I am not making this up!) was laden with anomalies, like little microbes swimming around in there and the cells clustering together for dear life, forming snakes. I was reminded of those old maps showing dangerous territory on the edge of the known: Here there be dragons. Apparently, the blood of teenagers who visit fast food joints a lot exhibits the twisted degeneration usually seen only in a much older person. Yeesh. I went out the next day and bought a lot of fresh vegetables. Then came the fun. As a group, we brainstormed ideas of how we might attempt to alter this information, and then conducted three experiments. First, we put love into it, doing so by gathering in a circle round the water, holding our hands out to it, and chanting “aum.” (I know: how California can you get, eh? <g>) Many of us reported feeling tingly fingers and “seeing” tendrils of light move from the water to each person and back again. The second round, we reminded the water of its original perfect nature, and expressed gratitude to it. This was my idea. I felt very sorry for the water at this moment, a bit ashamed about the dissing way we’d been speaking about it right there in front of it. I mean yes, it is city tap water and does indeed have pollutants in it, but really! Would you like all of your flaws to be magnified like that by a group? If it were me, I’d start to shrink away, forgetting that I had any good qualities at all. I wanted this water to glow, knowing it was appreciated. So I suggested that we remind it of its original pure state; how beautiful it is, and how grateful we are to partake of its essence and be given life by it. This time, we held hands in a ring and one by one, following the suggestion from my linguist friend Matthew Bronson, we spoke aloud our gratitude. I went first, and sort of went into a bardic trance, invoking its Beauty in what someone later called “a breathtaking prayer from the heart.” It did feel good. There’s something right about opening one’s throat to spontaneously sing the praises of that which gives us life! Other spoke similarly in turn. The room grew hushed and the atmosphere in the room felt rarefied, uplifted. And afterward, I knew that water was holy. The third round, we did what Beverly had been setting us up for all along: to try and turn this water into wine. The blasphemy angle alone tickled the heck out of me. She showed us graphic representations of the molecular structure of Chardonnay, and we tried to replicate it in this water using our minds. The group asked if I would start with another imaginal invocation. So I verbally led them through the path the water takes to become wine: its arising to the surface through a spring high in the Sierra Nevada mountains and also simultaneously falling as rain, then the way it burbled down through the groundwater and traveled aboveground down through the various river tributaries, eventually making its way to the Eel River, down the Russian River, and into the fertile soil of Sonoma County, where young grapevines eagerly sucked it up, growing tendrils and leaves and fragile blossoms that are visited by eager bees and insects and eventually ripen into ever-growing, ever sweetening fruit, warmed by the sun and watched over by the moon, cycle upon cycle, until each grape is perfectly juicy plump and tart and is picked and crushed by loving hands, then laid to bed cradled by oak, until ahhh! finally tasted, here, by us. Well, you get the idea. Eeny meeny chili-beanie, presto change-o zap! Heeeere’s wine. We sat back down as Beverly digitized the images and then showed us the corresponding data for each of our experiments. We had indeed changed the molecular structure of every sample of water we had “touched.” The wine was about halfway there: not as big or bright as Chardonnay, but much more than the original tap water. Then she suggested we conduct an addendum to the experiment which had never been done before: to see if we could taste the difference between the waters. Physically, remember, it was all the same stuff: tap water from the sink in that building. There was only enough charged water in the test tubes for two tasters. Matthew and I volunteered. (I did it mostly because I really wanted that second water in my body!) We turned our backs as Beverly and her partner Harry Jabs rigged up tasting cups of each of the three and then administered them to us in random order. Matthew and I might get the same kind at the same time or we might not. All we knew is that we would each receive one sample of each experiment, three in total, with no duplication. My strategy was to ask the water to reveal itself to me, then open up as much as possible to it in my subtle bodies – like when attempting to see/feel in diagnosis for shamanic healing – before tasting it. Each water did seem to have its own unique quality. For example, one had a tart-and-sweet taste to me, and was sort of light too, not unlike sauvignon blanc. So I guessed this was the wine. Matthew and I both reported “sweetness” in that round of samples. These turned out to be the wine for me, and for him, the sweet taste was love. Awww! We also received “plain” tap water to cleanse our palates in between tastings. We found this delightfully amusing. But you know what? We experienced something remarkable here. The first tap water seemed quite neutral, as one would expect, but the ones in between the charged waters actually tasted bad to us. Wild, eh? I thought that phenomenon could be my mind playing tricks, so drank the third sample with that in mind. And indeed, it did not taste bad to me at first – but then it developed an aftertaste! In the end, Matthew got one right and I got all three. Statistically, this is unlikely but not hugely significant. The wildest, most interesting thing of all was that we actually could taste differences in these waters. Rubik’s experiment speaks volumes about how the quality of our attention matters. We all know this and experience it every day, yet we forget. We fall into the tyranny of multitasking instead of offering our full attention to whatever presents itself. Are we listening to one another deeply, or with half our minds somewhere else – perhaps even planning what we’re going to say in return instead of hearing the original idea? Another aspect: Objects created with full loving attention carry that special energy with it forever. Compare, for example, a handmade journal vs. one that was mass-produced by sweatshop labor and machines. Even if the former’s materials are not the finest, the personal energy and love put into its creation infuses it, conferring a subtle quality that makes it far more valuable. When we touch a lover or small child or someone in pain, the way in which we do it; the consciousness behind the act, seriously impacts the way the touchee will experience it. A touch with deliberately concentrated love behind it can be instantly healing, soothing, invigorating; like a drink of cool water or a warm fire in winter. Such attention can mean survival, too – for example, noticing the colors and scents of our food. Get hold of a bad fish and don’t notice that until it’s half eaten? Too late! Pay more attention next life.